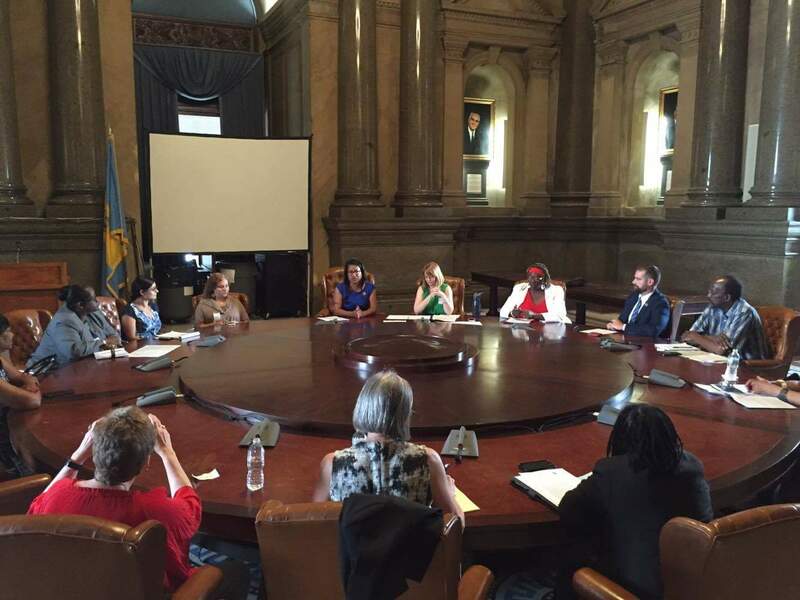 Equal Pay for Black Women Roundtable at City Hall | Come Check out Our NEW Site! Thank you to everyone who attended the roundtable discussion on equal pay co-hosted by Rep. Donna Bullock and the Women’s Law Project, including Rep. Tonyelle Cook-Artis, Rep. Brian Sims, Brenda Shelton-Dunston of the Philadelphia Black Women’s Health Alliance, Samuel Jones of Restaurant Opportunities Center (ROC) United, Jovida Hill of the Philadelphia Mayor’s Commission for Women, community organizer Denise Ripley, and Jazelle Jones of the Pennsylvania Commission for Women. Yesterday marked the day of the year that Black women had to work until in order to catch up the earnings of a non-Hispanic white men the prior year. 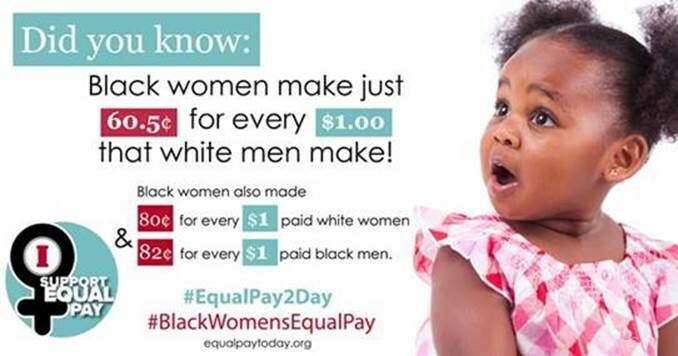 Pay discrimination cuts across almost all industries and demographics, but the problem disproportionately affects Black women and women of color, who experience a double pay gap. 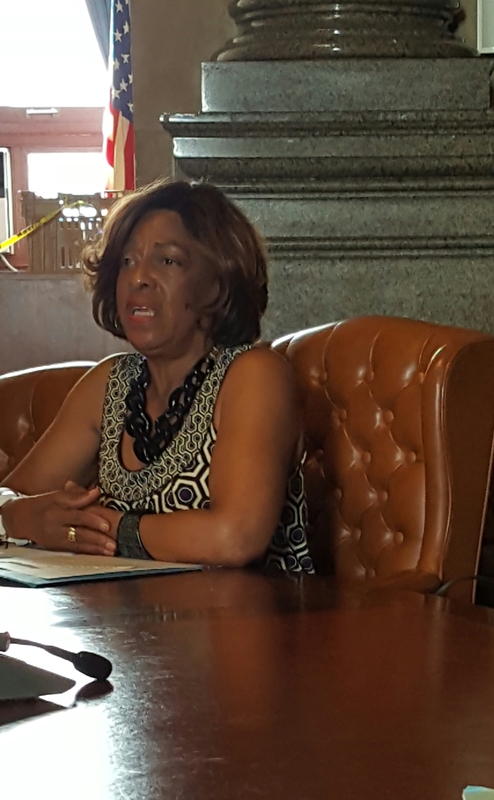 Brenda Shelton-Dunston of the Philadelphia Black Women’s Health Alliance spoke to the affect of pay inequity on women’s health. The Center for American Progress gave Pennsylvania a D+ ranking for economic security, and the number of children living in poverty is on the rise. Indeed, just today, a new state-by-state analysis ranked Pennsylvania 47th for women’s equity. These abysmal scores are unsurprising given the Pennsylvania Legislature’s refusal to fix the state’s broken equal pay law, raise the minimum wage beyond the federal minimum of $7.25 per hour, ensure basic workplace protections for pregnant or breastfeeding workers, or even extend the state’s sexual harassment protections to all female employees. In recent years, legislation has been introduced that would address all of these issues. Expert testimony about these problems and the disastrous affect they cumulatively have on the economic security of Pennsylvania families have been submitted for lawmakers’ consideration on almost all of these issues. Yet these bills, including legislation to fix Pennsylvania’s broken equal pay law, have not been passed into law, despite ever-expanding evidence of Pennsylvania families falling behind as a result of outdated policies. The Women’s Law Project, as members of both the Pennsylvania Campaign for Women’s Health and the national Equal Pay Today campaign, will continue to advocate for equal pay and related issues in Pennsylvania. To stay posted on our progress, like the Pennsylvania Campaign for Women’s Health on Facebook. This entry was posted in Equal pay and tagged Equal pay, equal pay for Black women, Equal Pay Today!, PA Campaign for Women's Health, PA for Women's Health, Pennsylvania, proactive agenda, Rep. Donna Bullock. Bookmark the permalink.